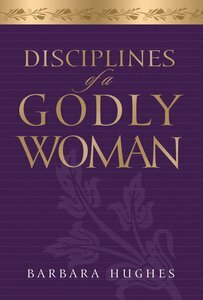 About "Disciplines of a Godly Woman"
Barbara Hughes has many years of experience as a pastor's wife. Married to Kent Hughes, pastor of College Church in Wheaten, Illinois, she is the author of Disciplines of a Godly Woman and co-author with her husband of Liberating Ministry from the Success Syndrome and Common Sense Parenting. She is the mother of four children. Customer Reviews For "Disciplines of a Godly Woman"
This book has been fantastic at challenging me to really think about how God wants me to live and actively seek to do things His way - the best way! Every chapter convicted me of something I needed God to help me change. I think every woman, young or old, should read this book! It is so useful, practical, and filled with Scripture.